The Bonnet Carré Spillway is located on the Mississippi River 28 miles above New Orleans, adjacent to the community of Norco. The spillway diverts Mississippi River water into Lake Pontchartrain with the flow going through Lake Borne to the Gulf of Mexico. The spillway is opened to protect the integrity of the flood protection system, reduce the pressure on the main levees, and lower the river stage. The spillway opening also reduces the velocity of the river current from the spillway southward. The Bonnet Carré Spillway was opened on May 9, 2011. The construction of the Bonnet Carré Spillway began in 1928 and was completed in 1931. The spillway was 83 years old on May 15, 2011 as it diverted Mississippi River water into Lake Pontchartrain. The spillway consist of 350 bays which are made up of 20 needles per bay. The spillway has been opened a total of 10 times: 1937, 1945, 1950, 1973, 1975, 1979, 1983, 1997, 2008 and 2011. Mississippi River water flowing through the Bonnet Carré Spillway on its way to Lake Pontchartrain. In 2008, 160 of the 350 bays were opened during April’s high river flow. As of May 19, 2011, 330 of the 350 bays have been opened. The below photo shows the Mississippi River water flowing through the opened gates of the Bonnet Carré Spillway. 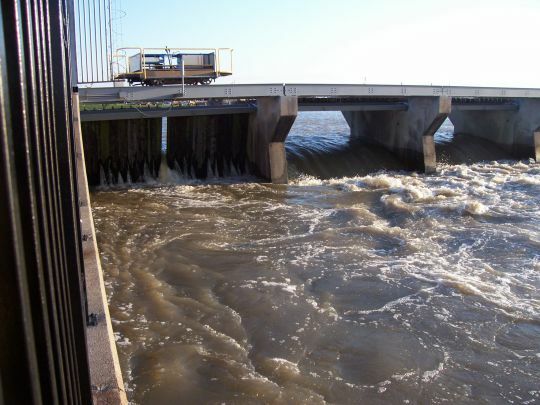 On the left in the photograph, the closed gates leak and allow Mississippi River water to flow, at a reduced rate, through the closed gates when the Mississippi River stage is against the Bonnet Carré gates. 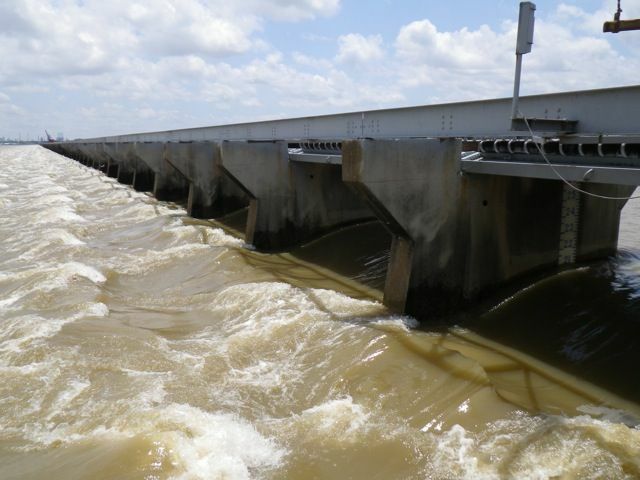 Flow through Bonnet Carré Spillway open gates on the right and leaking through closed gates on the left. A Corps of Engineers representative at the Bonnet Carré Spillway indicated that the flow through the spillway is four time that of Niagara Falls. Additional bays are scheduled to be opened as the Mississippi River continues to rise. The projection for 2011 is that all of the 350 bays will be opened on the Bonnet Carré Spillway. As a result of opening the Bonnet Carré Spillway, the ecosystem of brackish Lake Pontchartrain and Lake Borgne are changed due to the fresh water and nutrient load of the Mississippi River water. In addition, the temperature of the lake water decreases due to the colder river water. The decrease in salinity along the coastal areas of the Gulf of Mexico impacted by the flow from the Bonnet Carré Spillway result in negative impacts to oyster beds and fishery nursery grounds. The opening of the Bonnet Carre Spillway (May 9, 2011) just north of New Orleans and the Morganza Spillway (May 14, 2011) upriver from Baton Rouge have served to lower slightly the river stage in New Orleans. The pressure on the levee system has been somewhat reduced and the flood stage river elevations have been stabilized in the areas of Baton Rouge and New Orleans. Shipping of commodities by barge and ship continue at a reduced rate on the Mississippi River. The industrial facilities along the Mississippi River have been negatively impacted but with a few exceptions have continued to operate. 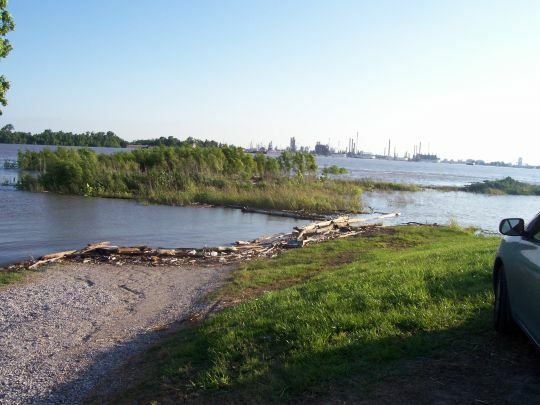 Surveillance of the levee system is occurring on an ongoing basis to identify areas of sand boils where leakage under or through the levees may be occurring. Mississippi River flooded batture in the foreground and industrial facilities across the Mississippi River in the area of the Bonnet Carre’ Spillway.